Utilizing a lead weighted "L" shaped wire form, the Real Pro's bottom bouncer's long wire feelers glide over jagged rocks, logs, stumps, moss and weed cover without snagging or hanging up. 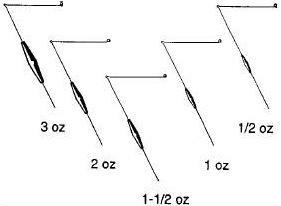 This new sinker concept works especially well when trolling with spinners, live bait rigs or floating artificial plugs. Size: 4" x 10". Unpainted. Swivel not included. Bottom Bouncers are also easy to make yourself.